Our four-bedroom, three-bath townhouse is ideal for families or groups, sleeping as many as 11 people. It has been designed with your comfort in mind. A spacious living room has a fireplace, loads of games, books, and a home theater system and FREE WIFI. The recently remodeled kitchen features granite counter tops, dishwasher, many appliances, and well-stocked with dishes and glassware. For your convenience, we have a washer and dryer in the house. BRAND NEW GYM IN THE REC ROOM THAT YOU ARE WELCOME TO USE! The location of our townhouse is convenient for skiers, shoppers, golfers, hikers, bikers, shoppers, and spa goers. We are just off the mountain road, less than two miles from town and five miles from the base of Stowe Mountain. The free Stowe Mountain shuttle stops within walking distance from our property. The five-and-one-half mile Stowe Recreation Path is adjacent to our property. The 120-acre Stonybrook community is nestled within woods and beautifully landscaped grounds. It boasts four tennis courts, two outdoor swimming pools, and a one-hole golf pitch-and-putt. Cross-country skiers can ski out their front door on the miles of trails within the Stonybrook property. There is a gym in the rec building you are welcome to use - includes a treadmill, bike, eliptical machine and weights. This house was perfect for our group of friends over a long holiday weekend celebrating a wedding. Rooms were cute and we loved the selection of games and coffee. Did not have a chance to check out the hot tub, as it seemed permananetely closed? Not sure! But overall great stay. This is a great condo and would be good for all seasons. Right between the ski area and the village, which happens to put conveniently close to Alchemist brewery, Idletyme brewery, Piecasso, Trapp family lodge, Doc Ponds, bike trail etc. Great vacation spot. 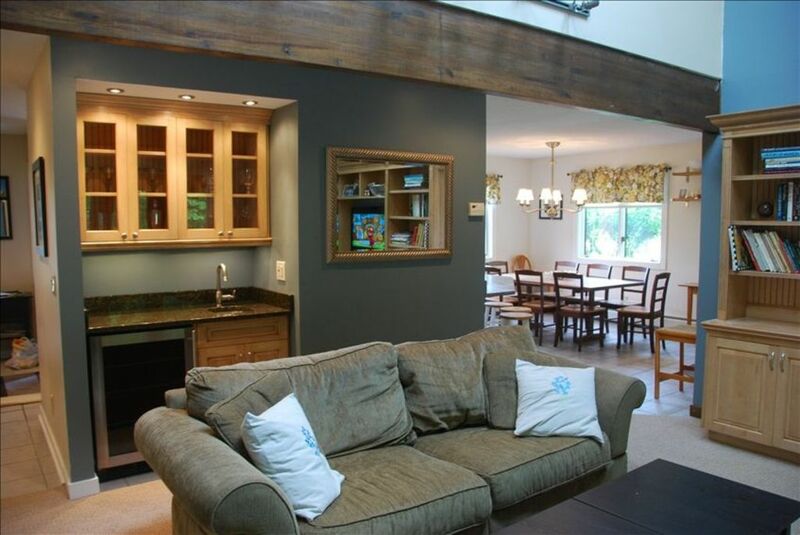 Very nice, quiet property, yet close to everything in Stowe. Only complaint: hot tub wasn't hot enough. This rental is well appointed with all of the necessities. The unit is clean and our stay was very peaceful. The entire property is well kept and seems very quite. The on-site hot tub is just down the street and was very relaxing. This unit is worth staying at! We had a family wedding and this place was the perfect location. The weekend was so busy, but any down time was spent relaxing at this comfy townhouse. We definitely recommend this place any time of the year. The common areas are not that spacious for a larger crowd. Living room was dark - could use more lighting. Ask what is and is not supplied - we had to buy soap. The heat is very noisy. We had nothing to clean the grill with so we bought a grill brush. It is close to the town path and short ride to ski slopes and cross country skiing and downtown. Rates are negotiable especially for last minute bookings or extended stays.